How’d they get it there? Magic. on top of the marshmallow fluff?” The morning sun through the café’s front window cast a golden halo around the child’s tiny frame. Thalia peered at her five-year-old daughter over the brim of her mug. She rested the cup in its saucer before answering. “They used a stencil in the shape of a little girl’s face and shook dried cocoa over it until it created the picture you see.” Better to start telling her daughter the truth and stop all of these nonsense games, as Harmony’s father used to call their stories. “No,” the girl proclaimed. “It’s magic.” Her aquamarine eyes grew rounder as she lifted her tiny fist above her cup. “The cook, who was once a fairy, whispered magical fairy words into his hand that only other fairies can understand. Then he blew in his hand and threw the words across my cup.” Harmony flung her fist over her cup, opening it as if she were casting pebbles in a stream. Her hand fell to her lap as she leaned forward to look at the picture. “And then the words came up out of the cocoa and made this picture.” Her story finished, she looked up at her mother and smiled. Those words were little comfort to Harmony who had spent the last two months as the center of her mother’s world. Now she would have to share her mother again with her father who wouldn’t understand that they simply had to check the yard every morning for elves and pixies. He would expect her mother to cook breakfast for him, to sit in the yard swing with him, to snuggle in the hammock with him in the evenings. They probably wouldn’t ever have time to check behind the back yard shrubs for fairy hollows or search for pixies that had become entangled in the honeysuckle vines along the fence. Harmony sighed and looked up at her mother. Then a thought struck her – maybe her father would be different when he came home. He had taken this vacation to get well. Maybe once he played with Harmony and her mother in their back yard, he, too, would see what they saw. Maybe. 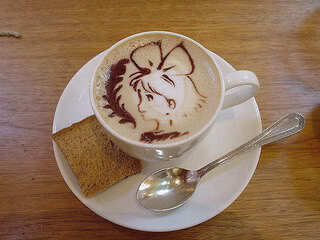 Harmony blew across the top of her cocoa to cool it, making a wish to the fairies for her father to be well. The sun’s rays twinkled in the picture on top of her marshmallow fluff before skittering away.